Staatsopernchor Berlin, Staatskapelle Berlin / Daniel Barenboim. Staatsoper Berlin, Schiller Theater, Berlin, Germany. Friday, April 14th, 2017. 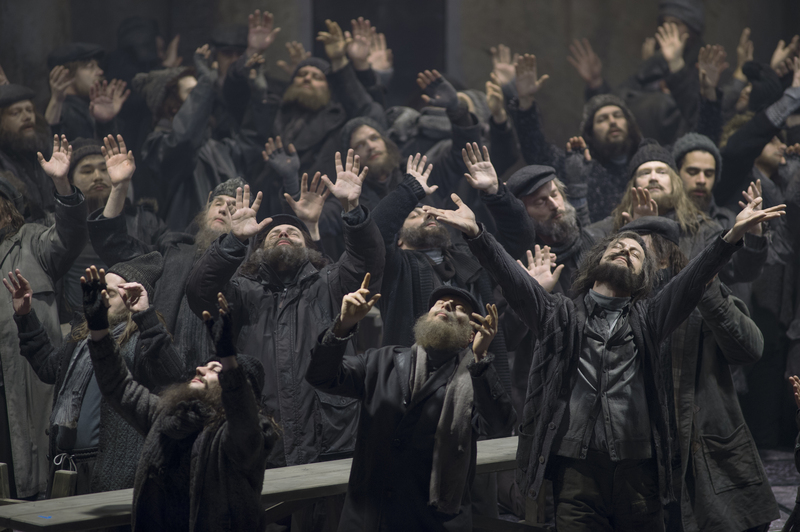 Any work of art remains open to multiple interpretations and watching Dmitri Tcherniakov’s staging of Parsifal, I questioned whether my reaction to it was a much part of my recent experiences and the current situation in the world as much as Tcherniakov’s vision. This was real ‘musiktheater’, a cogent and convincing narrative, based on an intelligent reading of the text that challenged one’s preconceived ideas about the work and transformed it into an evening that combined music, text and physicality to provide an overwhelming experience. Ultimately, we are all products of our experiences and certainly for me, this was an evening of raw power. Central to Tcherniakov’s thesis is the chorus’ statement of ‘selig im Glauben’ (blessed in belief), with the act of believing perhaps even more important than what one believes in. The grail knights were a hyper-masculine society – Kundry, the only woman on stage, initially mistreated by the squires who taunted her. Dressed in the costume of a visiting doctor, bringing the balsam from Arabia for Amfortas, her statement of ‘ich helfe nie’ made complete sense as it was hard for one to conceive of why Kundry would actually want to help a group of people who treated her so badly. Likewise, as the ritual of the grail began, she was unceremoniously shown the door by the knights, unwelcome in a world that was only open to men. In this, I felt Tcherniakov very much highlighted the highly complex nature of Kundry’s personality, as well as drawing attention to a misogyny at the heart of the work in the way that women are seen as tempters to be avoided. Tcherniakov also draws attention to the brutality of religion and how belief, especially Christian belief, is based on the suffering and sacrifice of an individual. Here the grail ritual involved Amfortas’ wound being revealed, with the blood drained and put into the grail which was then passed around the knights to drink. Titurel was a commanding figure in a long black trench coat, who inserted himself in a coffin to announce his lines, emerging later to be hailed by the crowd. The word ‘erbarmen’ (compassion) appears frequently in the text and yet there was no compassion for Amfortas who was made to suffer to satisfy the religious rituals of the knights. To an observer, these rituals looked unnecessary, brutal even, and the way Lauri Vasar’s Amfortas struggled in pain as Titurel announced the unveiling of the grail with its associated bleeding of the wound, was harrowingly brought to life. The idea of the power of the father coming from the sacrificing and suffering of the son was one I found extremely pertinent. Yet it also raised the issue of the irrationality of belief, of how people abandon rationality to believe for the sake of believing and of how they can be misled by a charismatic leader who can enable, assemble and get others to do things that strike an outsider as destructive – not to mention brutal and vicious. In that respect the staging is very much of the now. At the same time, that idea of belief for the sake of belief was also reflected at the end. Parsifal walks off, leaving the knights desperately supplicating for answers yet finding none now both Amfortas and Titurel, and thus the foundation of their belief, are dead. What Tcherniakov also achieves is in drawing the journey of Parsifal from innocent to charismatic faith healer. 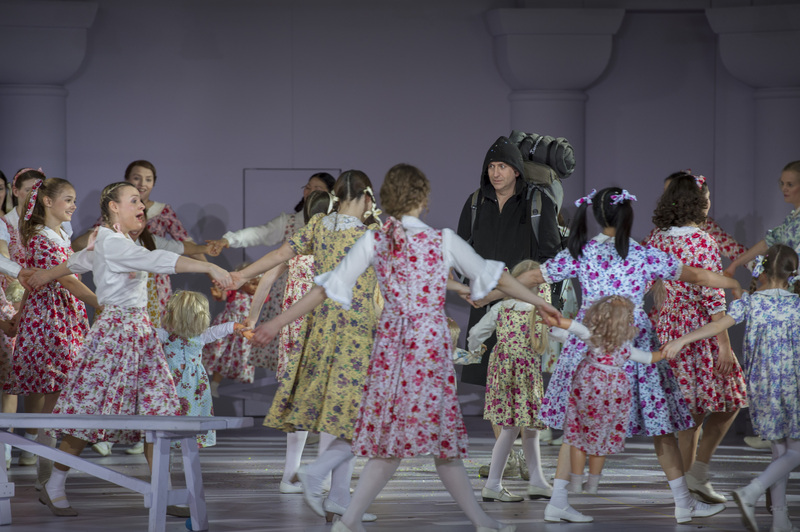 We see him first as a young backpacker, yet as the evening develops we see his charisma grow and his ability to transform Kundry from someone who was unable to cry to someone who shed tears at the end of Act 2. I must admit to having problems with the character of Kundry and her transformation from wild woman to seductress to servant. Tcherniakov resolves this by showing how resolution for Amfortas comes through finding compassion for Kundry and a passionate kiss. Yet that compassion is incompatible with the brutal physicality of the grail knights with Gurnemanz stabbing Kundry at the end, thereby preserving the masculine exclusivity of the knights. I imagine there may be some who view this reading as nihilistic. I found it devastating and it was fully realized by a cast who gave everything to the service of the work and Tcherniakov’s vision of it. As I mentioned at the top, this was an evening of total music theatre and its success was very much also as a result of the exceptionally high musical values on display. Likewise, one was aware of the connection between the text and the regie due to the excellent diction of the whole cast. 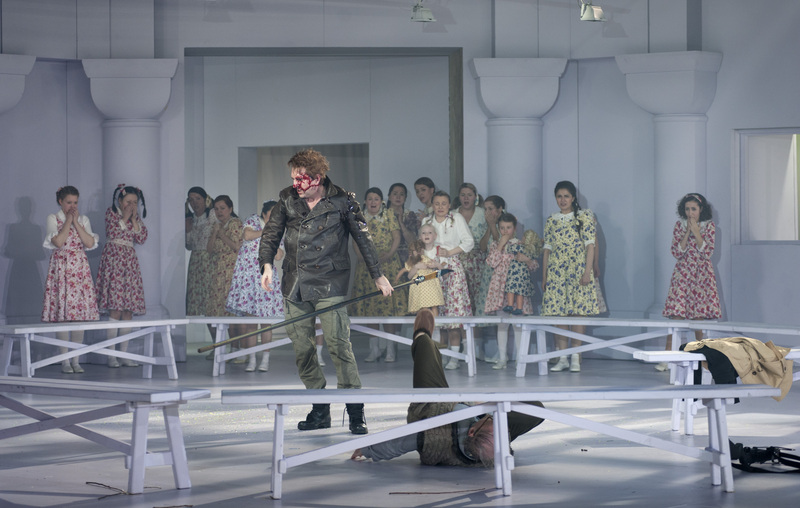 Andreas Schager was a phenomenal Parsifal. The voice of course strikes by its sheer size – the amplitude is staggering – but its impact is heightened because he uses the volume sparingly. He isn’t afraid to fine the tone down to a perfectly supported pianissimo without ever compromising the core of the tone. His passionate outburst at ‘Amfortas, die Wunde’ was absolutely massive, the voice always put at the service of the character. Anna Larsson’s Kundry impressed through her unflinching commitment and willingness to give everything of herself. Hers wasn’t a bel canto Kundry and it’s clear that the role takes her beyond her limits. She does have all the notes yet unfortunately doesn’t quite have the ability to sustain the high-lying phrases, with intonation suffering as a result. Her ‘ich sah das Kind’ was sadly not easy on the ear. Despite that, this is a role that can benefit from an interpretation like this and her somewhat wayward vocalism was a match for the ‘wilde Weib’ of the libretto. Her ‘lachte’ was terrifying and one left the theatre with admiration for an artist willing to go beyond her comfort zone and give everything that she had to the service of the work and to her public. Similarly, Lauri Vasar was a lighter and more youthful Amfortas than one might normally expect and I found it an extremely convincing reading in this context. His handsome baritone was never pushed and he brought the pain and horror of Amfortas’ existence to life, through his eager pointing of the text and gripping dramatic presence. René Pape also sang with a very human attention to text and was in particularly good voice tonight. His Gurnemanz here was a true believer, willing to sacrifice others to maintain order. One felt comfortable in his vocalism and his reading felt intelligently paced throughout the long evening. Tómas Tómasson was an excellent Klingsor with just the right amount of acidity in the tone and Matthias Hölle was a resonant Titurel, maintaining solid tone while singing lying on his back in a coffin. The chorus was superb singing with great amplitude, warmth of tone but also fine blend. The off-stage ladies weren’t ideally pitched at the end of Act 1 however. The orchestra was magnificent. Right from the opening pages of the prelude, one had that glorious feeling of hearing a hundred people live and breathe as one, making a sound carved as if from granite. It wasn’t quite flawless, a few horn cracks here and there and some of the wind chords were a bit ragged, but other than these passing moments it really was playing of the highest distinction. 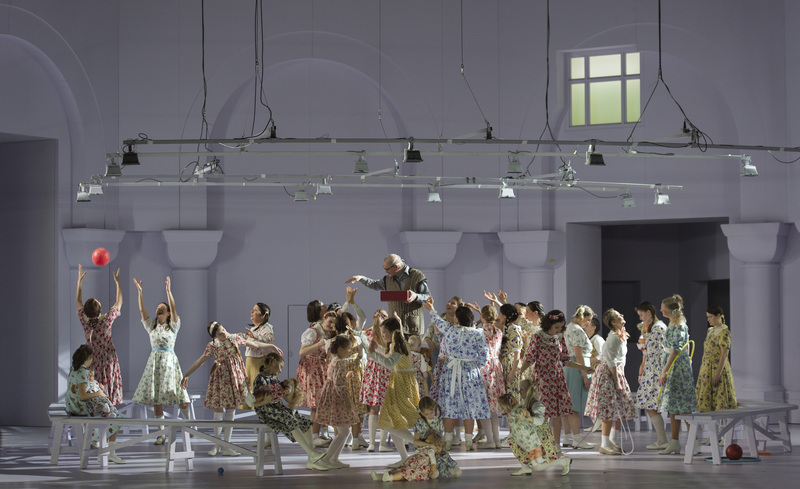 Daniel Barenboim’s conducting was always attentive to his singers, never afraid to pull back and allow the voices through, but also to allow the orchestra to bloom and produce some massive, theatre-filling sounds. Indeed, the way Barenboim built the climaxes was absolutely masterful. At the same time, I did however feel that his tempi in Acts 1 and 3 were perhaps too slow. It felt that he was revelling in the sound of that fabulous band but I longed for some more dramatic impetus. Given the strength of the reception and the immediate standing ovation when the maestro took his curtain call, I imagine I’m very much in the minority in that respect. Tonight was an evening that reflected what great opera is all about. We had a staging that was a revelation and allowed one to reflect and think of the work as new. We were given splendid orchestral playing and choral singing with individual portrayals that, even where they were not a natural fit, still gave performances of immense dedication and commitment. This was one of those evenings in the theatre that engaged, thrilled and troubled in equal measure – precisely what opera should be. 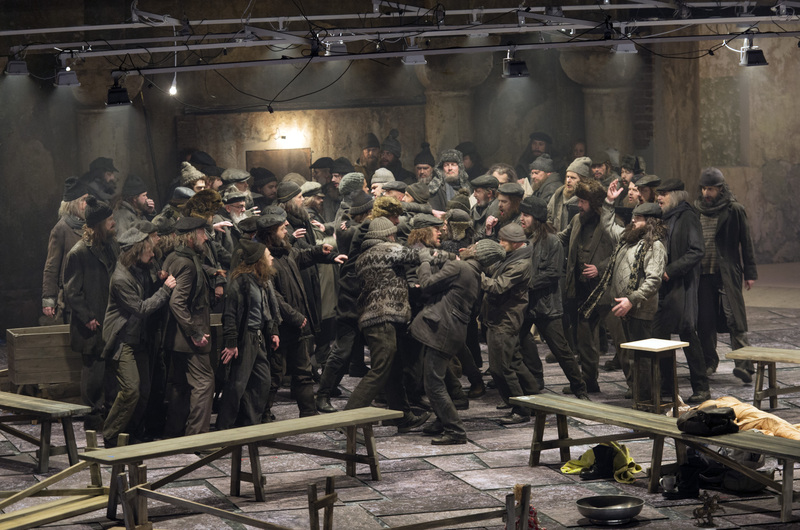 I am very delighted to read your review about Tcherniakov’s Berlin Parsifal which I attended on Saturday, 8th. I had problems with Tcherniakov’s reading of the character of Kundry, too.